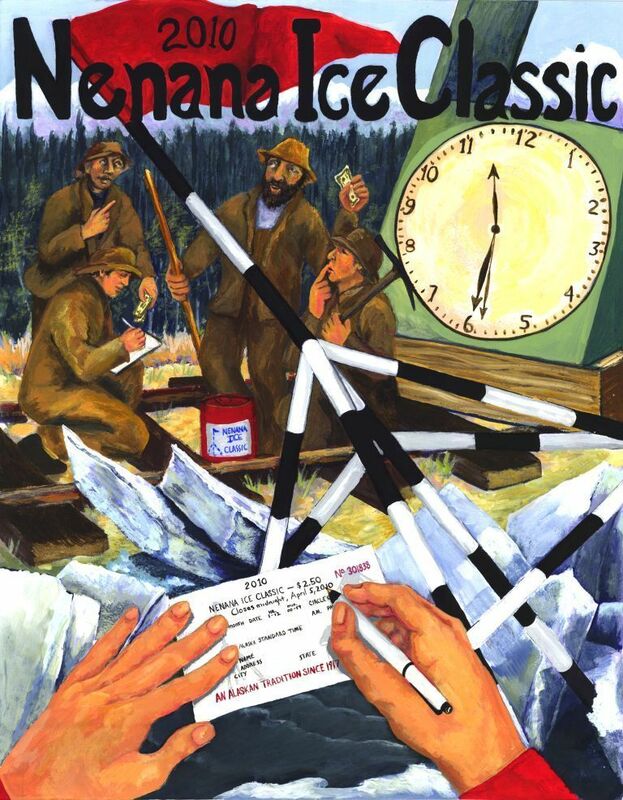 The deadline for the 2010 Nenana Ice Classic is just around the corner. The last day to purchase tickets is April 5th. I’ll be grabbing a couple myself. Official ice measurements this past Thursday ( 25 March 2010) were more than 50 inches thick, which is a mark reached only six times in the last 22 years. This could mean a later breakup date, but even though it’s 47 degrees here today 50 inches is a lot of ice. The measurements are taken each week and can be found on the Nenana Ice Classic’s Ice Measurements page. 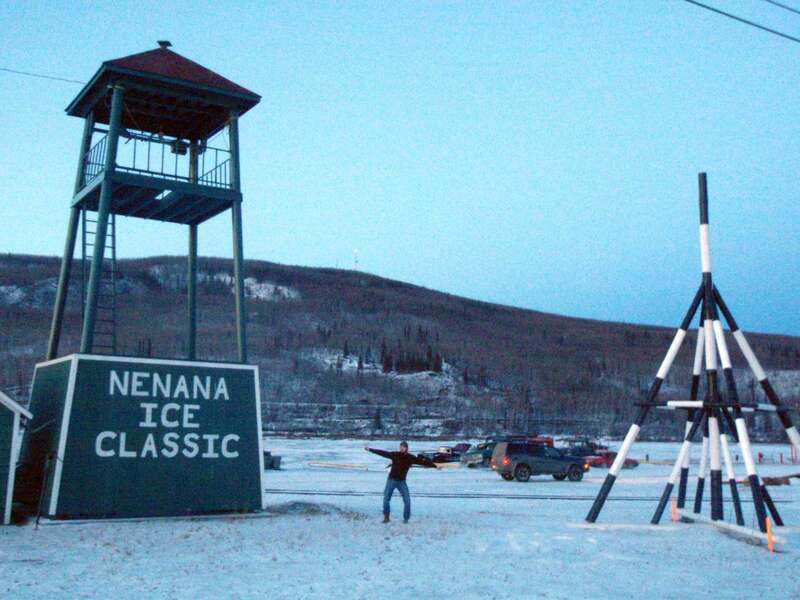 The Nenana Ice Classic is an event that has been taking place for more than 90 years. It got its start with a group of surveyors working for the Alaska Railroad in the spring of 1917. Sitting around without much to do while to river was still impassable on account of ice, they started a betting pool on when it would breakup allowing supply boats to reach them. 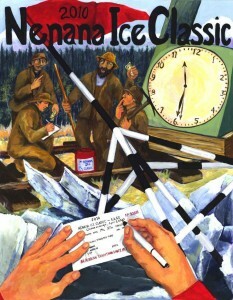 From these humble beginnings the Ice Classic is now an event synonymous with spring in Alaska. The 2009 Jackpot was $283,723. Well, it’s grown to be quite an event. Come about the first week of March the Festivities begin with Tripod Days, sort of like a carnival with everything from poker tournaments to bubble gum bubble blowing contests, sled dog races to turkey shoots. 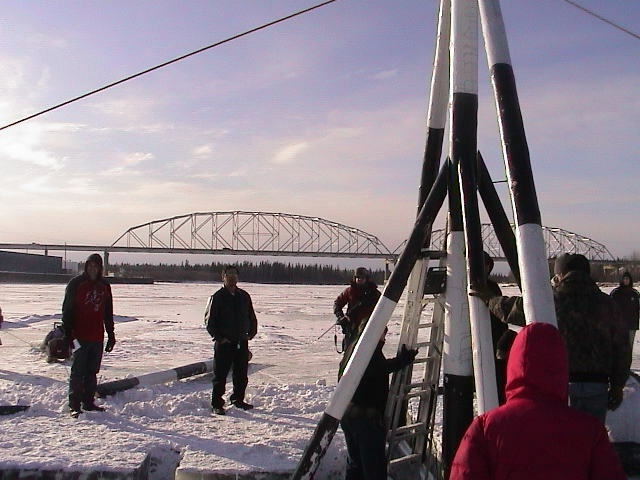 But the single most important aspect of the festival is the raising of a large wooden tripod atop the ice of the Tanana River. It took place on March 7th this year. A line is strung from the top of the tripod to a clock in the watch tower on shore. 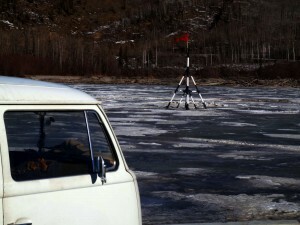 When the ice either moves downstream or melts out from under the tripod enough to tighten the slack in the line it trips a clock in the tower that records the precise moment of breakup. There are large red tin cans placed in businesses all over Alaska where residents place their bets on the exact date, hour and minute for a going rate of $2.50/bet. Multiple winners split the Jackpot and the winner is the bet closest to the actual time. Here you can find the History of Breakup Times. I really wanna win the 2010 nenana jackpot! But the thing is I don’t know what it is! I don’t think they determine the 2010 jackpot until after all of the tickets are collected and counted from around Alaska. The contest closed yesterday, April 5th, so all of the red cans with the tickets should be on their way back to Nenana today. I imagine we’ll find out what the jackpot is in a week or so. I have been trying to open your website to view the latest ice thinkness and have been unable to do so. Do I have it right?